Failure to attend the first day of school will likely result in loss of enrollment status. If a student fails to submit a note from the parent within 3 days the absence will be considered unexcused. If a student is absent for 4 or more consecutive days, a doctor’s note is required to excuse the absence. 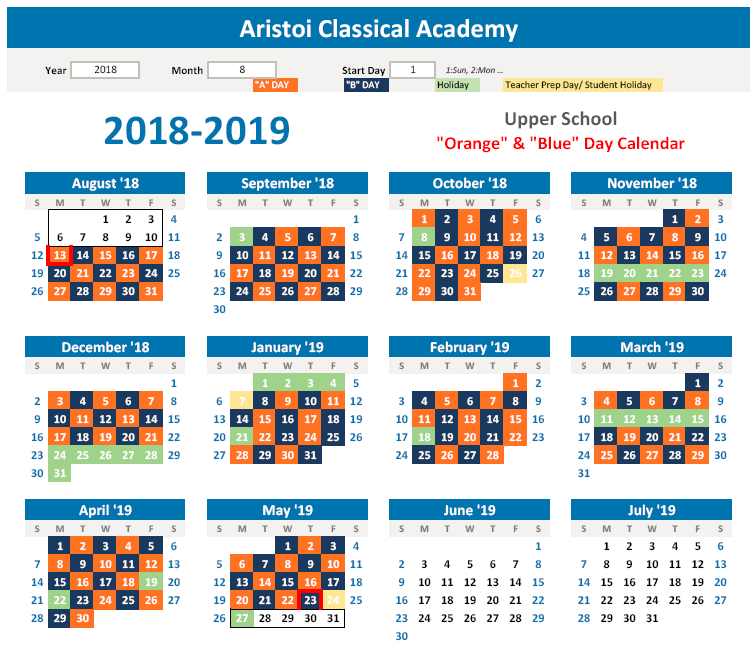 Students must attend 90% of school days to qualify to pass to the next grade level or maintain enrollment in ACA for the following school year. The Headmaster will address any deviation from this policy in accordance with policies adopted by the ACA School Board (“Board”). Parents may make a written appeal to the Board on behalf of their child. The Board makes the final decision on attendance-based appeals as determined by state laws. A student may not attend extracurricular activities on a day he/she is absent. Absence from school to observe holy days so long as a written request is provided to the Headmaster 24 hours prior to the absence and is approved. Family vacation, reunion, wedding, etc. Each unexcused absence will be entered on the student’s record. Absences remain unexcused until a valid written excuse is received. If a parental or doctor’s note is not received within three (3) days of the absence, the absence is automatically considered unexcused. Students will receive a zero in each subject for all unexcused absences, excluding major projects and tests. It is the responsibility of the student to obtain and complete all make-up assignments. Students are allowed one day for each day absent to make up the work missed. Teachers will assign zeroes to missed assignments not made up. Parents will have misdemeanor charges of Parents Contributing to Nonattendance filed against them. Except as provided by TEC Section 25.092, a student in any grade level from kindergarten through grade 12 may not be given credit or a final grade for a class unless the student is in attendance for at least 90 percent of the days the class is offered. (a1) A student who is in attendance for at least 75 percent but less than 90 percent of the days a class is offered may be given credit or a final grade for the class if the student completes a plan approved by the school's principal that provides for the student to meet the instructional requirements of the class. A student under the jurisdiction of a court in a criminal or juvenile justice proceeding may not receive credit or a final grade under this subsection without the consent of the judge presiding over the student's case. The Board shall appoint one or more attendance committees to hear petitions for class credit by students who are in attendance for fewer than 90% of the days the class is offered and have not earned class credit under the plan for receiving School credit outlined in Section (a) above for students who attended at least 75% of the days the class is offered. Classroom teachers shall comprise a majority of the membership of the committee. A committee may give class credit to a student because of extenuating circumstances. The Board shall establish guidelines to determine what constitutes extenuating circumstances and shall adopt policies establishing alternative ways for students to make up work or regain credit lost because of absences. The alternative ways must include at least one option that does not require a student to pay a fee authorized under TEC Section 11.158(a)(15). A certified public School employee may not be assigned additional instructional duties as a result of serving on the committee outside of the regular workday unless the employee is compensated for the duties at a reasonable rate of pay. A member of an attendance committee is not personally liable for any act or omission arising out of duties as a member of an attendance committee. If a student is denied credit for a class by an attendance committee, the student may appeal the decision to the Board. The decision of the Board may be appealed by trial de novo to the district court of the county in which the School’s administration office is located. The provisions regarding class credit do not affect TEC Section 25.087(b) regarding a student's excused absence from School to observe religious holy days. The availability of the option developed under TEC Section 25.092(b) (credit under a plan for students with at least 75% attendance) will be in accordance with Board-adopted policies and guidelines. A student may not be given credit for a class unless the student is in attendance for at least 90% of the days the class is offered. The student is in jeopardy of not receiving credits if the student acquires nine or more absences in a semester. A student is allowed 18 absences for an entire school year OR 9 absences per semester. It does not matter if the absences are excused or unexcused. A student who exceeds this limit is subject to repeating the grade and possible withdrawal from the School. If a parental or doctor’s note is not received within three (3) days of the absence, the absence is automatically considered unexcused. Continued unexcused absences will result in either disciplinary action for the student and/or truancy charges against the parent. Students exceeding the 10% allowable unexcused absentee rate during the first semester are subject to review as to whether they are eligible for continued enrollment at ACA. It is the family’s responsibility to have a child at School on time each day to maximize the learning opportunities for a child. Special requests for absences due to extenuating family circumstances must be made in writing to the Headmaster. Factors considered in granting the special request will include student’s academic standing and the number of absences. Tardiness is a form of absence and interferes with student learning. Elementary school Students arriving after 7:45 a.m. are tardy. Upper School students arriving after 8:00 a.m. are tardy. Five morning tardies in any one semester will result in detention, and ten tardies in one semester will result in a one-day in-school suspension. Fifteen plus tardies in a semester may jeopardize future enrollment. Parents will receive a letter after the third tardy. Elementary early morning detention begins at 6:45 and Secondary early morning detention begins at 7:00--Latecomers will need to reschedule the detention with the attendance clerk. Perfect attendance awards will not be awarded to students who have five tardies during any one grading period. Please be aware that any subjects missed due to unexcused tardies or unexcused early signout of a student (other than a School-sponsored early release) may result in a teacher’s inability to help students make up missed work. In such cases, parents will be responsible for helping their children complete their assignments. Unexcused tardies or early sign-out of students will be considered an unexcused absence for that subject. If it becomes necessary to delay or close the School because of bad weather, ACA attempts to follow the same schedule as Katy ISD. Announcement of closings will be made on Channel 13 (TV station) and the ACA website. An email will be sent thru parent communications to parents with an email address on file at ACA. ACA will notify the parent or the person listed by the parent as the emergency contact person if a child is judged to be unable to participate in a normal day’s activities or to be suffering from a contagious condition. The child will be isolated from the other children until he/she can be picked up. It is the parent’s responsibility to pick the child up within one hour of the School’s notification. Children suffering from fever, vomiting, diarrhea, or any contagious illness must stay home from School 24 hours from the last episode and without the use of medication to control the problem. A child suspected of having Pink-eye/Conjunctivitis will need written clearance from a doctor upon returning to school. If a student needs crutches, a wheelchair, special shoes, or clothing while at school, a note will be required from a doctor. The school policy is NO LICE – NO NITS. We cannot make exceptions. A no-nit policy is necessary since up to one-third of nits hatch despite the use of (lice) pediculicide shampoos. The most crucial step in ridding a child of lice is the removal of the eggs (nits) by using a fine-toothed comb or tweezers. There are no known products available over-the-counter that kill head lice eggs one hundred percent of the time, according to the CDC. In order to maintain control of this issue, classes will be checked periodically and randomly. If it is confirmed that a child has head lice, then every child in that class will be thoroughly checked, as well as any siblings in the school. Students will be treated with the utmost respect at all times. If a sibling attends a different school and/or daycare, it will be the responsibility of the parent to notify those facilities. In addition, teachers in grades Kindergarten through 5th grade will be trained to inspect for lice periodically based on alerts from parents or a physical indication (scratching, visible bugs). When students are identified with lice or nits, parents are contacted by phone and a letter sent home with the other students in the class and grade. Affected students will be given an excused absence for one day for the treatment of lice. A parent MUST accompany their child upon returning to school to the front office with proof of treatment (box or store receipt). At that time, the student will be checked by office staff and may remain at school only if they are clear of lice, nits, and egg cases. If nits or egg cases are found, the parent will assist the Student Care Employee with the removal of the nit or casing. These procedures will help to diminish infestations. Notify parents of child who has lice. Check all students in that class for lice. Notify classmates’ parents that lice has been found. Remove children with head lice. Treat child’s infected head and personal belongings and check all occupants of that home. Accompany child back to school.